BagAChat is an innovate app delivering you a personalized and enhanced solution for your WhatsApp conversations. BagAChat app helps WhatsApp users make meaningful use of their WhatsApp chat messages not for a single time but as long as they want. As of September 2015, WhatsApp had a user base of 900 million, so you can assume the potential it offers to every segment of the industry. Be it realty, hospitality, banking, retail, ecommerce or insurance. Every segment is eyeing to tap the potential customers using WhatsApp. Insurance industry in India, Brazil and Germany, Singapore, South Africa, Dubai are already on their way to make smart use of digital strategies in their business. However, the biggest obstacle to making digital technology effectively is the lack of right skills as a per a survey report. Customer experience and communication is a key to nurture existing and attract new customers in insurance industry. Insurance professionals are making smart use of WhatsApp for receiving various health and claim documents, for sending policy updates, meetings, notices and new policy announcement details and premium reminders. However, it is not as convenient to save, search and organize important WhatsApp chat messages, media files and documents using WhatsApp. It generally takes time for a prospect to convert to an actual policy holder, agents and professionals have to save their WhatsApp chat details for a long time until the policy is actually bought. Until that time there is a chance of you losing the important chat messages from your prospective customers as WhatsApp removes old messages typically more than 2-4 weeks old. Save all important messages from clients in WhatsApp in bagachat app to ensure 10-12 months old messages are also seen when required. Knowledge of past communication or history of communication helps and gives a personal touch to your service. No need to write in diary separately anymore to maintain these sales leads. Agents and Development Officers (D.O.) have big WhatsApp groups. Each group has hundreds of people sharing thousands of messages. 10-20% of those messages are important to refer in future also. BagAChat helps you to keep saving (or searching?) messages in app. Use ‘SEARCH’ feature to search by 1) sender name 2) group name 3) from-to dates 4) labels 5) text 6) media type. So e.g. if all messages by a particular D.O. are to be searched quickly, just select his name and all his messages appear together. 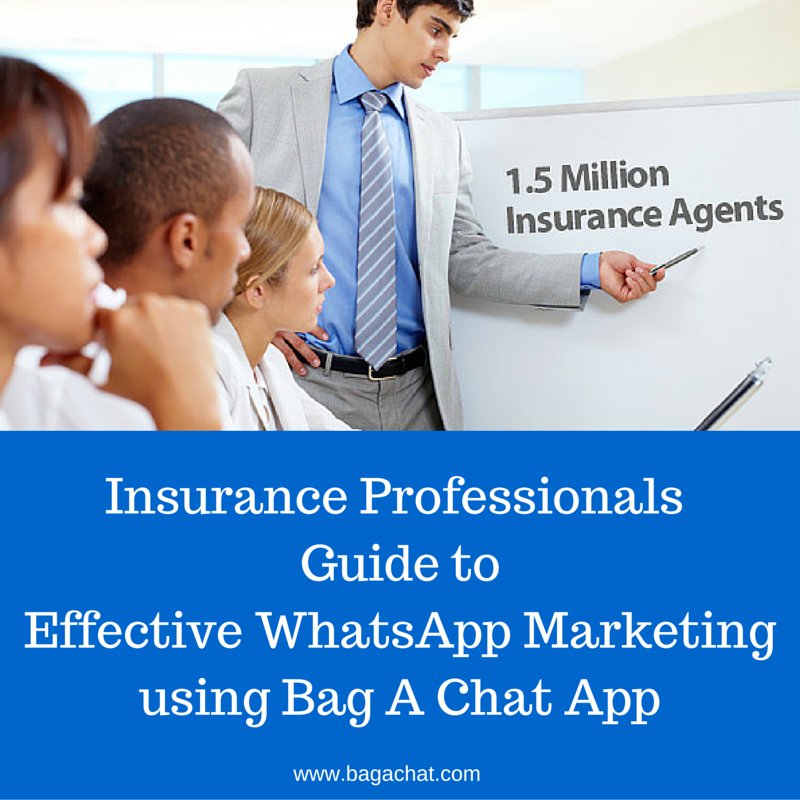 In WhatsApp groups, many contact details are shared by insurance professionals and agents to each other. However, we don’t immediately save those in our phone book. When after 3 months we need to contact that person and we try to search the contact, then either WhatsApp has deleted it Or it is difficult to search in 1000+ messages added after that. In BagAChat, Using SEARCH ICON and media type as ‘CONTACT’ immediately all contacts are visible. Address/maps can also be searched quickly. 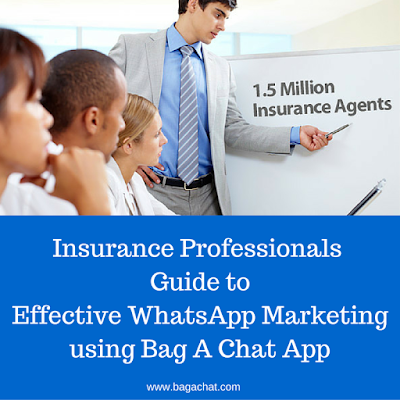 D.O.s and insurance agents share important information about policies on WhatsApp groups. There are queries also discussed by agents and customers on the same. However, later this information can’t be searched in thousands of other messages and multiple conversations. So after saving, add LABEL (e.g. name ‘Money plus policy’) to the specific set of messages regarding that policy. So now, all those messages will be visible together in one folder in app named e.g. ‘Money plus policy’. Many a times, customer informs that after 3 months I will buy the policy, then REMINDER can be created using Bagachat app. It has the WhatsApp chat messages from customer added in mobile calendar for reference for adding the reminder to follow after 3 months. This reduces your chances of missing the follow-up and losing your future customers. Moreover, you also get rid of maintaining separate diaries for follow-ups. If a person is interested in buying a policy, then agents take the photos of some documents. These photos are visible in photo gallery in random fashion mixed with other photos. Many a times, agents take photos of documents and photos of several customers in a day and at the end of the day save them on computer or take printouts. Sometimes, it becomes difficult to identify which photo is of whom and whom does the document belong to. In this case, With BagAChat app, you can select ‘GALLERY’ option while saving. You can select all these photos from gallery and add a LABEL to those e.g. ‘Customer Raj Malhotra’s photos’. So those photos are then visible at one place anytime in future. D.O. have a separate group for themselves where important topics are discussed. Some reports, statistics etc. are shared. After adding LABELS to these, all these messages can be emailed together or added to Google drive together. Since some of the information is important on WhatsApp, we do not delete that information such as photos, videos and pdf documents. This affects your memory space in the mobile and may possible make your mobile speed slow. In this case, you can save important messages on app and then clear all the unwanted WhatsApp chat. Your phone remains always fast, as WhatsApp does not eat more data space. Insurance agents and D.O. are having personal WhatsApp groups as well. Sometimes, the new policies, changes in policy, etc information is shared by agents on these groups. BagAChat app enables message senders to see when is the group most active to ensure that maximum people read their message. To check this report in BagAChat app, Save group conversation Long press on the group name Select CHARTS Icon  Select ‘TIME MACHINE’ report. It shows the hours when the group is most active. So, share your marketing material in those hours only and get maximum readership plus confirmed data of who’s read your message or not. Insurance professionals, be in any country India, Singapore, South Africa, Brazil, UK, Spain, Malaysia, Hongkong, Australia or Dubai can use this app and make effective use of WhatsApp marketing for better success in insurance business. In fact, some of the agents and insurance firms have opted to get a customized version of Bag A Chat for their business. Everyone is using BagAChat app. Do not be left behind and lose the business. Install BagAChat app now.